(California Chronicle) - After nearly 20 years of having their poor health dismissed as "post traumatic stress", Gulf War Veterans finally have a way to show the legitimacy of their illness, Gulf War Syndrome. Gulf War Syndrome is a complex bunch of symptoms that are seemingly unrelated. Pain, numbness, tingling, fatigue, brain fog, chemical sensitivity, emotional changes, and other subjective symptoms make up the syndrome. In recent years, toxic exposures during deployment have been linked to Gulf War Syndrome. At the annual Society of Toxicology meeting, functional MRI brain scans were presented which clearly identify physical differences in the brains of Gulf War Syndrome victims when compared to healthy counterparts. Further, they can identify three distinct forms of Gulf War Syndrome. Each form of Gulf War Syndrome is linked to a different toxic agent. The agents are Sarin nerve gas, pyridostigmine bromide (a nerve gas antidote), and pesticides. Each of these agents produces a consistent physical change in basal ganglia of the brain that is believed to lead to neuron die off. The brain must find alternate routes around the damage, leading to decreased brain function and symptoms related to the loss of function in the damaged part of the brain. The basal ganglia controls cognition and coordination. Damage to the basal ganglia may lead to problems with speech, motor control, and memory. Symptoms may include difficulty walking, poor memory, tremor, tics, and repetitive movements. Other conditions related to the basal ganglia include Huntington disease, Tourettes syndrome, and Wilson diseases. Other findings include altered blood flow to the brain and damage to the myelin sheath similar to that seen is multiple sclerosis. While this information will likely lead to diagnostic tests to enable doctors to definitively diagnose Gulf War Syndrome, an appropriate treatment or cure has yet to be discovered. This article originally appeared in the MCS America News, April 2010 Issue http://mcs-america.org/april2010.pdf. For more articles on this topic, see: MCSA News. (Boston, Mass - BUSPH) Sixteen months after a panel of experts issued a landmark report affirming that exposure to toxic chemicals may have affected thousands of veterans of the 1991 Gulf War, the U.S. Department of Veterans Affairs has agreed to re-examine the disability claims of veterans suffering from ailments they blame on their war service. "This is really a big step," said Roberta White, chair of the BU School of Public Heath's Environmental Health Department and scientific director of the Congressionally-mandated panel known as the Research Advisory Committee (RAC) on Gulf War Veterans' Illnesses. The committee is based at BUSPH. "It's exciting to do a piece of work and see that people may actually benefit from it. Having been one of the first people to study Gulf War illness -- going back 18 years -- I'm just so thrilled to see this sea change in the way it is being viewed," White said. In a recent interview with the Associated Press, VA Secretary Eric Shinseki said the decision to re-examine disability claims was part of a "fresh, bold look" his department is taking to help veterans who suffer from what is known as Gulf War illness, and who have long felt the government did little to help them. The VA said it also plans to improve training for clinical staff who work with Gulf War veterans, to make sure they understand the cluster of symptoms that characterize the illness and do not dismiss them, as has happened to many veterans over the years. In November 2008, the RAC panel of scientists and veterans issued a comprehensive report asserting that Gulf War illness was a "real condition" affecting at least one in four U.S. veterans of the 1991 Gulf War. The group cited numerous studies showing that the condition was linked to exposure to toxic chemicals, including pesticides and pyridostigmine bromide (PB), a drug given to troops to protect against nerve gas. White has done numerous studies on the effects of such exposures on Gulf War veterans. Former Secretary of Veterans Affairs James Peake sent the RAC report to the National Academy of Sciences' Institute of Medicine (IOM) for review and recommendations. But Peake was replaced soon afterwards by retired Gen. Shinseki, who quickly took an interest in the Gulf War veterans' plight, White said. White said she and other members of the federal committee have had a number of meetings and conversations with Shinseki's staff -- especially with chief of staff John Gingrich, a retired Army colonel who commanded a field artillery battalion in the 1991 war. "Ever since [Shinseki] came in, he and his staff have really shown a commitment to Gulf War veterans," she said. She said Gingrich had attended the last RAC meeting "to talk with us about how the VA is trying to change the system." White said only a small proportion of Gulf War veterans have been approved for disability compensation, so the re-examination of claims will be a major undertaking for the VA.
As many as 175,000 to 210,000 Gulf War veterans are believed to have experienced a pattern of symptoms that include rashes, joint and muscle pain, sleep and gastrointestinal problems, according to the RAC report, which reviewed dozens of studies on veterans. What caused the symptoms has long been a subject of both inquiry and controversy. Independent scientists have pointed to pesticides and pyridostigmine bromide pills given to troops as probable culprits. The 2008 report noted that since 1994, $340 million has been spent on government research into the illness -- but little has focused on effective treatments. VA officials said the agency is not planning to give a new benefit to Gulf War veterans, but is making sure that the claims that were submitted were handled properly. "We're talking about a culture change, that we don't have a single clinician or benefits person saying 'you really don't have Gulf War illness, this is only imaginary' or 'you're really not sick,'" Gingrich told the Associated Press. The VA says it plans to review how regulations were written, to ensure that veterans received the compensation they were entitled to under the law. The VA then would give veterans the opportunity to have a rejected claim reconsidered. White, who is associate dean for research at BUSPH, recently was named chair of the Department of Defense's Gulf War Illness Research Program Integration Panel, which will guide the allocation of funds for further research. She has been called on a number of times in recent years to provide testimony to Congress about Gulf War illness. Last summer, White told a U.S. House Veterans' Affairs subcommittee that just as Iraq and Afghanistan veterans are being diagnosed with post-traumatic stress disorder based largely on self-reported symptoms, so, too, should the physical complaints of veterans of Gulf War veterans be taken seriously. She said that while diagnostic tests often cannot detect the neuropsychological symptoms of Gulf War illness, years of research have shown that veterans of that conflict who were exposed to chemicals may suffer central nervous system deficits and associated health problems. "When patients are seen clinically, neuropsychological test results and brain imaging can be interpreted as being normal, even among patients who experience significant health symptoms and functional problems in daily life," White said in her testimony. 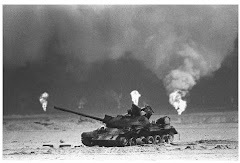 "The clinical and research evidence suggest that health symptoms complaints in Gulf War veterans should be taken seriously, especially if the veteran has known exposure to neurotoxicants in theater." The provision of chemical precursors from United States companies to Iraq was enabled by a Ronald Reagan administration policy that removed Iraq from the State Department's list of State Sponsors of Terrorism. Leaked portions of Iraq's "Full, Final and Complete" disclosure of the sources for its weapons programs shows that thiodiglycol, a substance needed to manufacture mustard gas, was among the chemical precursors provided to Iraq from US companies such as Alcolac International and Phillips. Both companies have since undergone reorganization and Phillips, once a subsidiary of Phillips Petroleum is now part of ConocoPhillips, an American oil and discount fossil fuel company, while Alcolac International has since dissolved and reformed as Alcolac Inc.
Veterans for Common Sense (VCS) offers the following five recommendations to fix the enormous backlog of one million veterans’ disability compensation and pension claims now under review at the Veterans Benefits Administration (VBA) and Board of Veterans Appeals (BVA), two sub-agencies within the Department of Veterans Affairs (VA). VCS applauds the efforts of Chairman Bob Filner and the House Veterans’ Affairs Committee for addressing this important issue. VCS thanks and offers to work with VA Secretary Eric Shinseki as he fixes both VBA and BVA this year. 1. Improve Transparency. Before substantive reform can begin, VCS urges VA to reveal the serious depth and scope of the claims crisis at VBA and BVA. VA leaders must admit the disability claim backlog is one million. VA leaders must also admit it takes five to six months to process a veteran’s original disability claim, and another four or five years to decide a veteran’s appealed disability claim. 2. New Leaders. VCS urges VA Secretary Shinseki to hire a new team of VBA and VBA leaders and then move them from 1800 G Street to 810 Vermont Avenue so they work closely with other top VA leaders to create a veteran-focused claim system. 3. Maintain Current System while Designing New System. VCS urges VBA and BVA leaders to take a two-track approach to reform. First, VA must maintain the current system so it doesn’t collapse under the influx of additional claims due to new regulations for Agent Orange-related conditions, post-traumatic stress disorder, and Gulf War illness. Second, VA leaders must simultaneously design an entirely new claim processing system using new technology such as the lifetime service record currently under development. Any new system should be automated using a one-page claim form and have a detailed timeline to eliminate the backlog. VCS urges VBA to place more VBA claims adjudication staff at VA medical facilities in order to provide friendly face-to-face assistance as well as to streamline appointments for claim examinations. 4. Expand Legal Representation. VCS urges Congress to allow veterans to retain competent, certified legal representation at the initial claim level at VBA. 5. Hire Our Veterans. VCS urges VBA and BVA to hire more veterans, especially our disabled veterans. More than one-in-five of our returning Iraq and Afghanistan war veterans are unemployed. VCS opposes outsourcing VA’s claims processing. As I've mentioned before, I'm really disappointed that the Veterans Affairs pulled the plug on UT Southwestern's research into the nature and causes of Gulf War illnesss. Vets deserve better. But as the research is winding down, we're learning more about UTSW's advances, thanks in part to brain imaging. We're learning that something different and troubling is going on in the brains of Gulf War vets. In this piece in Science News Richard Briggs, one of the UTSW researchers, says, "In the last two years we have learned more about Gulf War Illness than we did in the previous 15." I don't understand all of the details, but that is a job for the researchers -- to spend countless waking hours conducting meaningful research. They need to be greenlighted. And when the UTSW research ends, I'm not sure who will pick up the ball and run with it. But I know this much. It must continue --and continue in good faith -- somewhere. The VA’s Environmental Epidemiology Service (EES) conducts original research studies on the health of Veterans, including research on potential exposures to environmental hazards during military service. EES also maintains databases and registries of Veterans’ exposures and health care utilization, which provide unique data for much of the research. Investigators: Han Kang, Dr.P.H. ; Clare Mahan, Ph.D.; Seth Eisen, M.D. ; Charles Engel, Jr., M.D., M.P.H. This is a follow-up study of 30,000 Veterans (15,000 Gulf War Veterans and 15,000 non-Gulf War military personnel) who were in service during 1990-1991. It is one of the largest scientific research studies ever undertaken on the health of Veterans. The goal is to find out how the health of Gulf War Veterans changes over time and if it is better, worse, or the same as non-Gulf War Veterans ten or more years after the war. To achieve this goal, researchers mailed survey questionnaires, conducted telephone interviews, and reviewed medical records. Specific areas under study are chronic medical conditions, PTSD and other psychological conditions, functional status, mortality, general health perceptions, health care utilization, and VA disability compensation between the two Veteran groups. Research findings from this study are currently being compiled and published in scientific journals, and presented to the scientific community. Han Kang, Dr.P.H. ; Clare Mahan, Ph.D.; Paul Levine, M.D. ; Samuel Simmens, Ph.D.; Heather Young, Ph.D.; Jessica Maillard, M.P.H. Although there were relatively few combat casualties in the 1990-1991 Gulf War, many Veterans were subjected to a wide variety of natural and man-made environmental exposures, some of which are considered potential human carcinogens. Because of concerns about increased cancer risks among these Veterans, Congress asked VA to address the question of potential cancer risk among Gulf War Veterans. to assess demographic, military, and in-theater exposure characteristics associated with the cancer. Gulf War and non-Gulf War Veterans with a diagnosis of cancer from 1991 to 2003 are being identified through record linkage of the Veterans’ database with files supplied by state cancer registries. This study will produce information with adequate statistical power to address the question on whether or not there is an excess cancer risk associated with the 1990-1991 Gulf War. Investigators: Han Kang, Dr.P.H. ; Shannon Boyer, M.P.H. ; Tim Bullman, M.S. ; Mitchell Wallin, M.D., M.P.H. We investigated the risk of post-war mortality from neurological disease among 620,000 Gulf War Veterans and 750,000 non-Gulf War Veterans. Gulf War Veterans may be at increased risk for adverse health outcomes, including neurological disorders, as a result of their Gulf War service. Specifically, there is concern that Gulf War Veterans may be at increased risk for amyotrophic lateral sclerosis, multiple sclerosis, Parkinson’s disease, or brain cancer. These risks may be related to potentially hazardous environmental exposures during the war, such as oil well fire smoke, chemical and biological warfare agents, prophylactic agents against chemical and biological warfare, multiple vaccinations, depleted uranium, pesticides, and endemic infectious diseases. Since our last follow-up in 1997, there have been few changes in mortality rates among Gulf War and non-Gulf Veterans. 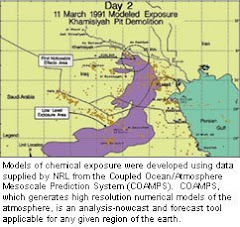 Controlling for oil well fire smoke exposure, Army Gulf War Veterans who were potentially exposed to nerve agents at Khamisiyah had a higher mortality rate from brain cancer compared to Army Veterans who were not considered exposed. The risk of death due to motor vehicle accidents is still higher among female Gulf War Veterans compared to female non-Gulf War Veterans, though no longer statistically significant among male Gulf War Veterans. This excellent letter/article written by VCS, and published at www.VeteransForCommonSense.org. VCS sent this letter to Senator Dianne Feinstein so she is aware of our efforts to determine the facts about our Gulf War chemical exposures. Veterans for Common Sense urges you to please retain Section 348 of H.R. 2701 of the Fiscal Year 2010 Intelligence Authorization Act during the conference with the House of Representatives. This vital section requires a declassification review of Central Intelligence Agency records that are pertinent to the health problems being suffered by as many as 175,000 of my fellow Gulf War veterans. We want to know why we are ill so we can get treatment. Between 1991 and 1996, the Department of Defense and the CIA denied any Iraqi chemical agents had been detected. In June 1996, as a result of pressure from two CIA analysts and a handful of Gulf War veterans (including me), the CIA announced it had discovered intelligence records revealing as many as 145,000 of us were exposed to low levels of Iraqi agents. [The U.S. Government has] identified more than 1.5 million documents as a result of the new electronic and office searches. But the task force does not plan to review each of these documents to determine which are relevant and process those documents for declassification and release. VCS asks the Senate join the House and retain Section 348 so these documents are reviewed. After 19 years of waiting, our ill Gulf War veterans deserve to know the facts about our exposures so we may receive medical treatments and benefits.